You want your special day to be memorable, and we know just how to make it so. Choose one of the most romantic towns in the Mediterranean, then add experienced staff, great food and charming locations, and what you’ll get is a perfect wedding reception whether it's for 30 or 300 guests. 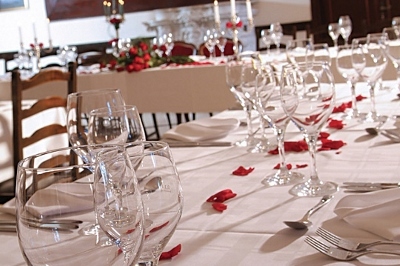 Exchange your vows in style at the Monte Mulini, the most stylish of all Maistra hotels. Have your ceremony under the stars, dance barefoot on the grass and enjoy the view of the bay behind you. An intimate wedding of your dreams for up to thirty persons in a luxurious environment with flawless service – you will find all that and much more at the Monte Mulini boutique hotel. Celebrate your special day on an island, a 15-minute boat ride from the centre of Rovinj. 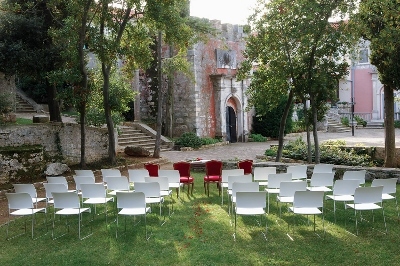 Enjoy the romantic charm of an old castle for your reception with its surrounding pristine nature. Spend your wedding night in one of our modern rooms or apartments distinguished by their special design and harmony of colours. Situated on a spacious area surrounded by a rich and beautifully tended Mediterranean vegetation, the restaurant of the Amarin Tourist Resort is surely the best choice for a large wedding reception. Its lovely white pebble beach, as well as the outdoor pool and restaurant terrace, offer a magnificent view of the old town centre of Rovinj. Start planning your dream wedding today. You can create your own wedding menu or simply rely on the experience and great suggestions, based on local wines and ingredients, of our chefs and sommeliers. Prepared with love and served with attention to detail, great food makes a great wedding reception – so do not hesitate to contact us with confidence. Our excellent staff will make sure your wedding reception is an unforgettable culinary experience for you and your guests. From the view of the sea from the Hotel Eden, with the soft grass beneath your feet, to a chapel by the sea and romantic receptions in the Hotel Istra or the sleek minimalist spaces of the Hotel Lone, Maistra locations are full of charm and ensure you a magical wedding experience. The great nature, historic town centres and designer interiors and exteriors of our hotels will provide perfect settings for your wedding pictures and a memorable experience for all your guests. Make it easy on yourself by engaging our experienced wedding planning service professionals who will organise every detail of your wedding according to your instructions and make it all come together as your dream wedding. Your wedding is a special day that you should enjoy – therefore leave all the worries regarding the organisation to us! Our experienced professionals will take care of every detail, so you can relax and focus on what's most important to you.